Most of us don’t much like to use the oven in the dog days of summer, but you might want to make an exception for bucatini alla pizzaiola, a delicious baked pasta dish that sings all the favorite flavor notes of southern Italy. It’s styled alla pizzaiola, literally “pizza style”, for its oregano-scented marinara sauce, the original topping for a Neapolitan pizza before pizza alla Margherita dethroned it as the Ur-Neapolitan pizza. Bits of mozzarella add to the pizza theme. All sorts of dishes can be made alla pizzaiola, including the eponymous Neapolitan meat dish you may have seen featured here on Memorie di Angelina. Make the marinara sauce following the recipe found in our post on Tomato Sauce 101, adding a few fresh basil leaves at the end. Leave the sauce quite loose. When the sauce is almost done, cook the bucatini in well salted water for no more than 3 minutes, just so they are pliable. (They will still be quite raw on the inside but no worries, they will cook further in the oven.) Drain and mix the pasta with about half the sauce and some grated cheese in a large bowl. Spread a ladleful of the remaining sauce at the bottom of a baking dish, add some of the dressed bucatini. Sprinkle over half the mozzarella and a pinch of oregano. Repeat with more pasta, mozzarella, sauce and oregano, then just pasta. 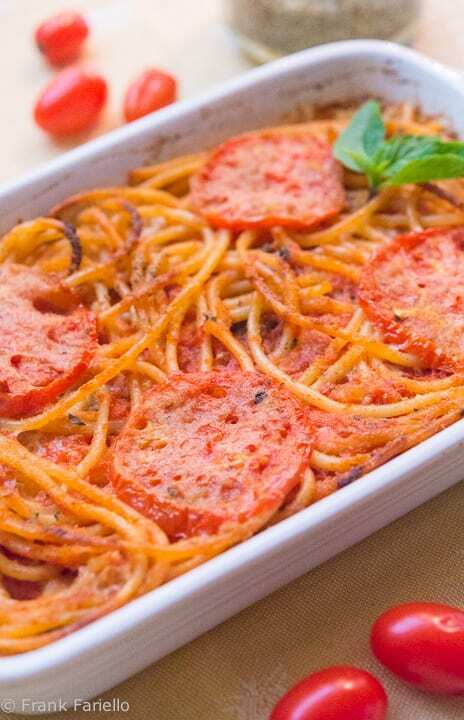 Top the final layer of pasta with slices of fresh tomato, the oregano and a pinch of salt, sprinkled with breadcrumbs and drizzle everything with olive oil. Bake in a hot (200C/400F) oven for about 20-30 minutes, or until browned on top. If you like a crusty top, you can let it run under the broiler for a minute or two at the end. Let the dish rest for at least another 20 minutes before serving. It is also very nice served at room temperature. Some recipes for bucatini alla pizzaiola you’ll find call for olives and/or capers in the sauce, which sounds like a nice option to me. For a more substantial dish that could serve as a one-course meal, another common variation adds canned tuna to the mix. Of course, if you use fresh, ripe summer tomatoes from your garden or farmers market for making your tomato sauce, you’ll experience this dish at its best. But if tomatoes are out of season or you just don’t have access to good fresh tomatoes, you can still make the sauce for this dish with good-quality canned tomatoes or passata di pomodoro. It’ll still be delicious. And the amount of tomato sauce is quite variable, depending on how ‘red’ you like your pasta. I’ve seen recipes calling for much less or much more sauce than indicated here—let your own tastes and instincts be your guide. Bucatini alla pizzaiola comes in a non-baked version: just make your sauce with a good pinch of oregano (plus olives and capers, if you’re in the mood), and dress you pasta as you would any other; you can add cubed mozzarella as you mix if you like. Just a quick appreciation post. Have just finished making this, and it’s such a lovely twist on the classic quick dish for during the week. Just wanted to note that I couldn’t get my hands on bucatini (they don’t carry it here in most supermarkets), but it turned out quite lovely with some factory De Cecco pasta (I took the one with the longest cooking time) and it came out just fine! Thanks so much, Rowald, for the kind words! I’m always thrilled to get feedback from readers who try out the recipes at home. And don’t worry, I’m not going anywhere! I’d turn on my oven for this one. Definitely. I wonder if there’s that sweet spot when tomatoes are still in the market and the temperatures have cooled off…. Yes, I definitely think so Frank! I sometimes feel like a little squirrel at this time of the year gathering all the things together nearing the end of summer…so sad…I always miss the tomatoes so much! Hmm…sounds delicious and certainly less fuss than a timballo! Not a big fan of most baked pasta dishes but this ones sounds so good I am going to have to make it! It looks beautiful. I like the slices of fresh tomato on the top. olá esta massa é dos Deuses. Niente dog days? Peccato! Spero che torna il sole subito prima che finisca l’estate! Great way to use up more of my garden tomatoes – I can just smell and taste the deliciousness.